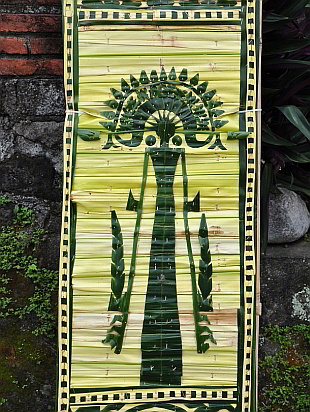 The line up of Balinese sacred days at this time of their calendar is astonishing, as is the dedication with which they’re celebrated. During Galungan, the spirits of the ancestors revisit earth, and at the same time, the triumph of Good over Evil is commemorated. These celebrations involve serious, intricate preparations, and take place on a +/- twice yearly basis. 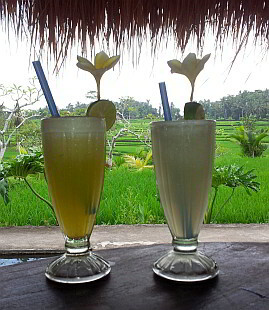 I’m starting to ask myself how locals juggle work-life balance! 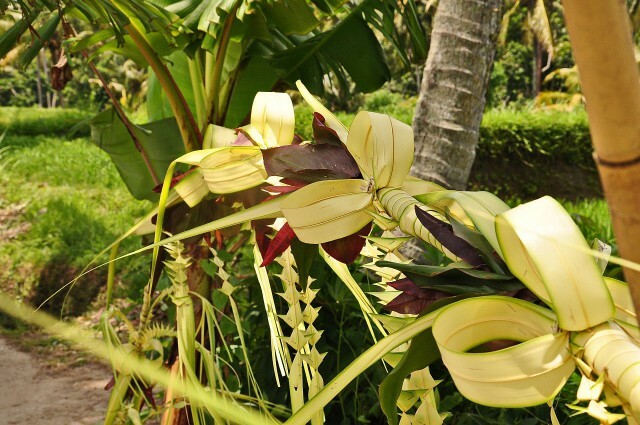 And business in Ubud has pretty much slowed to a stop again, for the four main days of the celebration…. 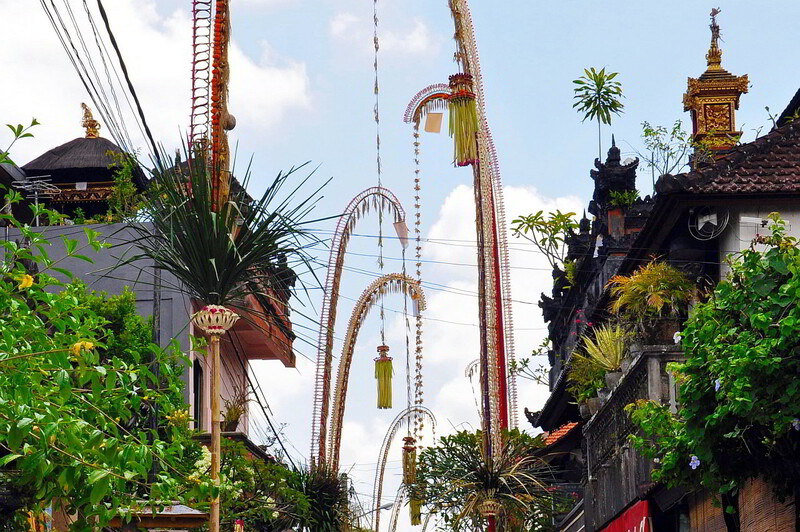 A Penjor belongs at the front right hand corner of every property where Hindus live and must be standing by 6 pm on Penampahan, the day before Galungan. Some say Penjors aren’t what they used to be, but for the unpracticed eye, they’re impressive and graceful. Several men worked on and off for two days, to prepare and decorate the Penjor on our property. Updating this, I’m happy to say that during our recent trip upcountry, along back roads, all Penjors were completely hand-made! During the 10 days following Galungan, we noticed lots of action in the temples and the village kids had a great time with the Ngelawang ceremony. Ngelawang is something like an exorcism rite, performed by a four legged beast called a Barong. 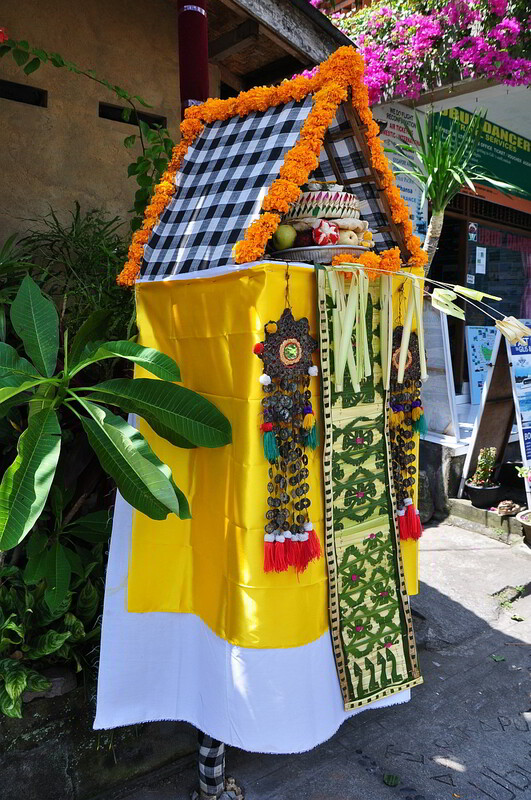 The Barong, (two boys hidden in a furry lion-like Barong costume) is invited into the houses as he prances through the village. His presence is said to restore the balance of good and evil in a home. 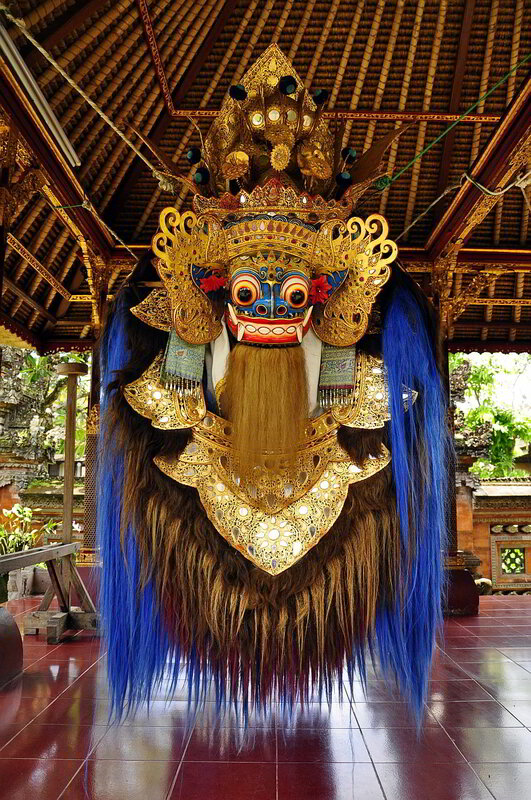 Here’s an adult-size Barong. We never got a clear shot of the cavorting child-size ones! 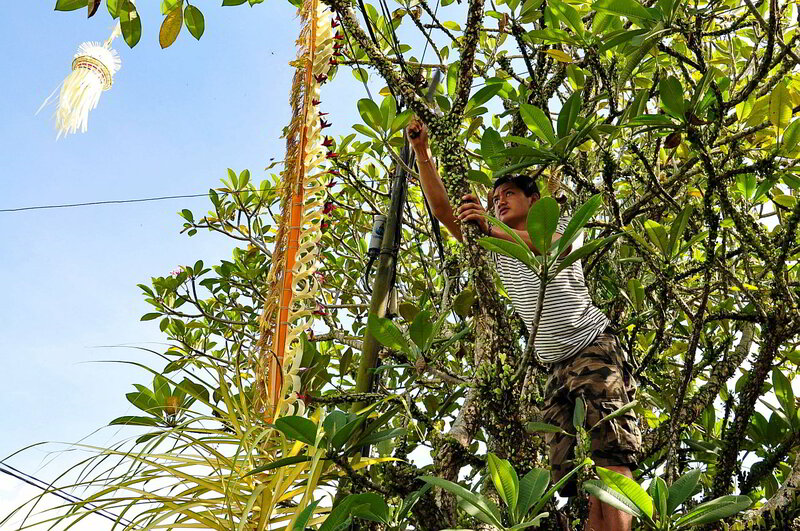 Finally, on Hari Raya Kuningan, ten days after Galungan, again accompanied by ceremonies and stacks of offerings, Good has vanquished Evil and the ancestor spirits return to heaven…… M says that means it’s time for a cold one! Vielen dank für die Karte. Ich war ziemlich überrascht, zu sehen, dass ihr den Schritt gewagt habt. Das tönt ja alles sehr toll. Wünsche euch viel spass und Glück auf euren Abenteuern. Danke für den “Besuch” und die guten Wünsche! Ja, wir habens gewagt, das neue Leben- es überrascht uns täglich! Und Wädi wird uns im Sommer wiedersehen. Bis dann eine prima Zeit!